Say it ain't so, Ara! Before you think I've jumped off into the deep end and have purchased a Bieber-Fever T-shirt, or have replaced all my conservative ties with purple ones, please take a deep breath, relax and read on. My wife ordered Justin Bieber's documentary/movie ("Never Say Never") a couple of weeks ago. My boys (5 & 7) seem to enjoy his music, and my wife (who is always looking for any opportunity to show our boys that hard work pays off) made popcorn and turned down the lights. It took about seven minutes until my wife called for me. I knew I should have put the noise-canceling headphones on sooner, but alas, I hadn't. "What?" I asked, although it wasn't really a question--it was an accusation. "You've got to see this." That's code word in our home. It means, come downstairs and check this out. Because, if you don't, we will all be disappointed in you. I may have uttered a couple of expletives. I may have even said, "No one understands my pain." I may have. I must admit that I walked downstairs having prejudged Bieber as another "created-in-the-studio" artist. No talent, but a phenomenal marketing engine. Thoughts of N-Sync & Spice Girls came to mind. I went to the den and to my surprise, my boys (thunder and lightning) were watching this movie. I mean really watching it. Anyway, I walked over, sat on the arm of the couch and next thing I know, 90 minutes had elapsed and I was entertained beyond my expectations. I went back to my office and sat in front of my manuscript, but instead thought of this young man's journey and the road ahead. It became apparent to me that if someone studied his road to success, then maybe on some level, we could apply it our own artistic journey. The journey of transforming from a writer into a published author. As writers, we have heard this before -- first, write a great book. I agree. But what's great to a romance reader, is not great to a YA reader. Know your audience. Ideally, you are a member of that audience. In the case of Bieber, the type of music he loved was the type of music he wrote. He understood what made him love artists like Usher, or Boyz II Men. There are a lot of questions floating around genre. You must understand why an agent cares and why the editor needs to know. But think about it from your perspective as well. Who will want to read this story? Who is your tribe? "My novel will appeal to to all current members of the Whig political party." Awesome, you're adressable market (the total market that could be converted into a paying customer) is a total of seven people. I was amazed to see how this young man spendt countelss hours with his vocal trainer/coach. Yes, my friends, he actually sings when he's performing live--no lip sync here. In fact, in the movie, he had strained his vocal muscles so much that he had to cancel a show. Understand that the two core elements that make you a better writer are: writing & reading. And by definition, those are on-going elements. Therefore, your education never ends. There is no such thing as "I am there now." That's an abstract notion. There is no "there" to get to, because it only ends when you've taken in your last breath. You work hard every day... oh wait, that's number three. You must work hard every day--but also be smart. Tim Ferris ("4-Hour Work Week") asks the question, are you being active or effective. Set goals (word count, marketing plan, etc) then go after them with passion and focus. You never make excuses. You never accept excuses. You are not only your own toughest critic but you must also be your strongest advocate. When no one wanted to sign Bieber, he and his manager hit the streets--planes, trains and automobiles. He went from one radio station to another. Just he and his guitar. He sang live and won over the DJ's. And he started building an audience. He built his platform by hard work and determination. No excuses. 4. You can create your "Platform"
In the movie, Bieber's manager (Scooter) tells the story of how none of the labels wanted to touch him. I paraphrase: "You need the platoform. He needs Disney or Nickolodean. You nead the machine." More of your potential customers (i.e. readers) spend eyeball time on their computer/iPad/smartphone than on TV or the NY Times. Understand what this means. You need to have a presence in where they're looking. Doing poetry readings at Chuck E Cheeses will not get you the audience you need. Also, you need to have an honest voice. You need to be interesting and relevant and entertaining (not like a clown, but you know... entertaining). You have to be humble. You have to be you. Your voice as a writer is that special, unique way you say things. Your followers will follow you because you're interesting and relevant. And when you have followers, don't be a snob. Everyone loves the underdog. Everyone wants to be recognized as one of the people that helped a talented individual breakthrough against impossible odds. Treat them with the respect that they deserve. Scooter is Justin's manager. 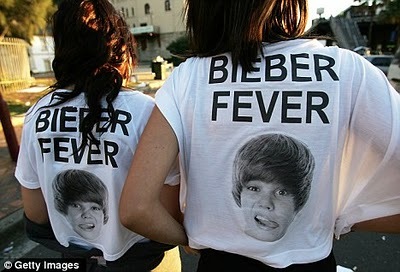 This guy belived in Bieber when no one else wanted to touch Bieber. He saw the talent when Bieber was barely fifteen (on You Tube by the way -- that's how Justin was discovered). He knew there was something there. And through all the rejections, he was never dissuaded. He worked even harder. Many aspiring authors, myself included, are searching for the right agent. I emphasize right. Not every phenomenal agent is necessarily the right fit for you. For my day job, I have hired hundreds, interviewed thousands. I only hire on fit. Fit matters. I know its tempting to jump on the first agent that shows interest. But this is a long-term relationship. The fit needs to exist for both of you. You are both investing your time/money on a joint veture. The right person is everything. First Who, then What. Even with an advocate, what Scooter needed was someone who knew someone. He went to Usher. Usher had the power, prestige and connections to help pave the way. Usher knew Scooter so he agreed to listen to this "kid." This kid, sang an Usher song acapella (no music, just his voice) and blew Usher away. As Usher says in the movie, "This was a no brainer." Maybe. But so far, no label had even considered Bieber. Usher was the connector. He found Bieber the producer, who in turn got this young man's music published. You never know who will help you. I find that the writing community has a lot of gems. And I am not referring to just their talent. But I mean as humans. They want to help. They want to give back. Behave like a professional. Be a connector for others. Do it, even when you're a relative nobody. Help others. If you love something you read, tell the world. Karma has interesting a way of helping you down the line. Treat your fans--your followers--with respect. They will be your wave to success. Treat them as if your career depends on it. Because it does. At concerts, his team goes out and upgrades seats for fans. Or give them free tickets if they were left without seats. It's the little things that converts a fan into a believer, and then into a loud chorus of appreciation. They will spread the word about you. This is the essence of word-of-mouth. And in today's democratized digital age, you never know who will be that person who will advertise you in ways that no full-page ad in the NY Times could ever dream of touching. I was impressed at the loyalty of his team. Sure, they are with the fastest growing artist in the world. Sure, they are now rolling in cash. But they were with him when he was a nobody. It wasn't easy for the first few years. There was nothing there. Yet, they stuck it out together. As I watched them in the movie I noticed something else. They were a family and they had the right attitude. Surround yourself with people who care about you and your dreams. Don't dwell in the negative stuff. Rejection letters are a part of the game. Please, oh please, don't post them on your blog. Don't badmouth the agent who "clearly is blind since you're the best thing since JKR, in fact, she stole your idea about Harry what's-his-name." Argh! Don't burn bridges--this is a interconnected highway with many connections. But more importantly, don't demean others in this industry who are trying their best. It's not easy. It can't be. Think about it and you'll get it. Finally, it's a small industry. When you attack one, you attack a few hundred people down the chain, and you show that you are not a professional. When you are dealt a bad hand, remind yourself why you write in the first place. I don't know about you, but I write because I have to. Because my sanity depends on it. Because now that I know I can, how could I ever pretend otherwise? Never thought I'd agree with a post labeled with "Bieber-Fever" but...gahh, make me say it...*grumble grumble* you have a point. :D Resist the temptation. Because if you do, you may even find yourself humming a tune or two afterwords... not that I'm doing that... I'm just sayin'. Google's new e-Reader... Yes, one more!